Can you find Jesus in this painting? After God scattered the people at the Tower of Babel, He knew it was time for the next step of His plan. 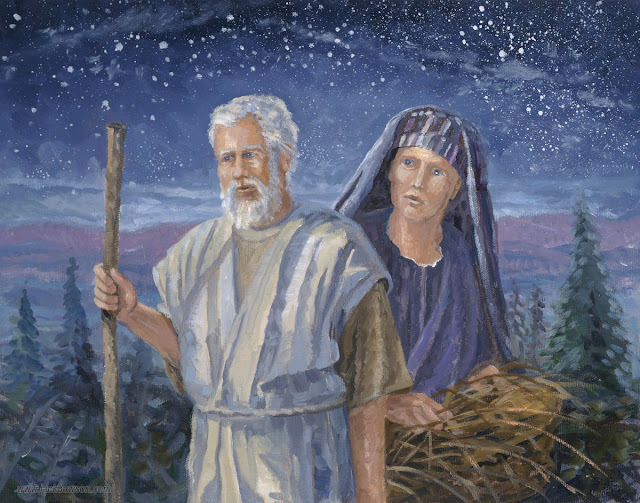 He chose Abraham, and told him He would make his family a great nation that would bless all people everywhere. Abraham chose to believe and obey God, even though God told him to leave the country where he lived. It would be the first of many sacrifices God asked Abraham to make, but Abraham was willing to follow Him no matter what. Do you know what a sacrifice is? Has God ever asked you to sacrifice something for Him? Abraham obeyed God, and God kept His promise to make him the father of a great nation, but probably even Abraham could not have imagined God would choose his family to bring the world the Savior, Jesus Christ! When we choose to believe and obey God and are willing to give Him whatever He asks, He promises He will give us more blessings than anything we might give up. Father, thank You for our family. Thank You that You have made a way for us to be in Your family forever. Thank You for Abraham. Help us to be like him and to be willing to go and do whatever You ask. Please help us understand what will please You, and give us the courage and strength we’ll need to do it. We love You, Lord, and want to give You our very best. Thank You for always blessing us more than we can ever imagine. Discuss how the Bible lists the names of family genealogies to show Jesus’ ancestry. Have your children draw their genealogy. Start with their name at the top. Then put their parent’s names on the next line. Then put their parent’s parent’s names on the next line. See how many generations you can name. The Name of Jesus is written in the stars above Abraham and Sarah’s heads.